The king of beasts is here! This was a long one to work on, as there’s a lot of stuff to talk about. Let’s begin! Shuten-dōji (Japan demon leader) got split up to his two names. If Kaido is DF’s user, can he not just kill himself by drowning? Didn’t he escape from Marine’s prison ship? How does he get out of the seastone handcuff? I think those are the biggest mystery if he is a Dragon DF user. And also they say the wound Kaido has in his belly (we can see it in both human and dragon form) was the wound which was given by Ryuma when he was still just a Dragon… And also thats why he is the strongest beast not strongest man…. Hi Arthur, what do you say about the moment when zoro and ryuma encounters. Zoro said something similar to “Legendary Samurai who cut the dragon” but he didnt say “killed”. 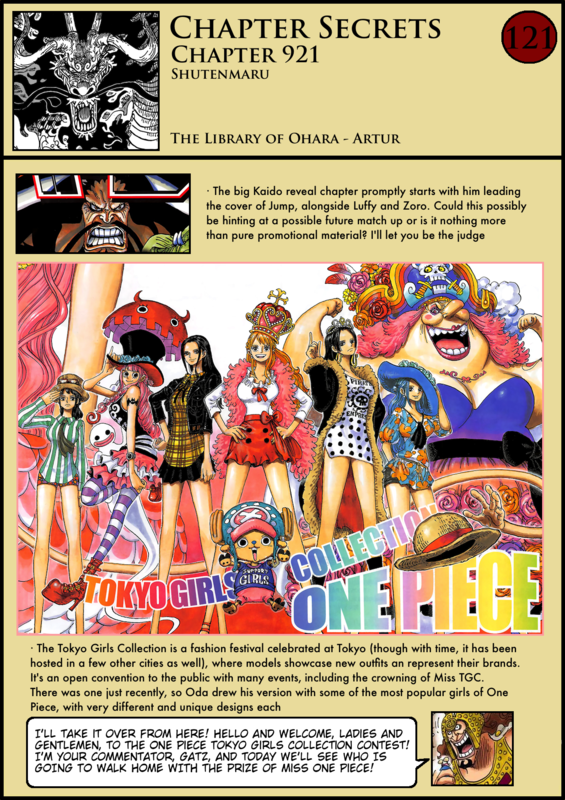 Oda doesnt do things without purpose. If he doesn’t say it here as “killed”, it should be for a reason. 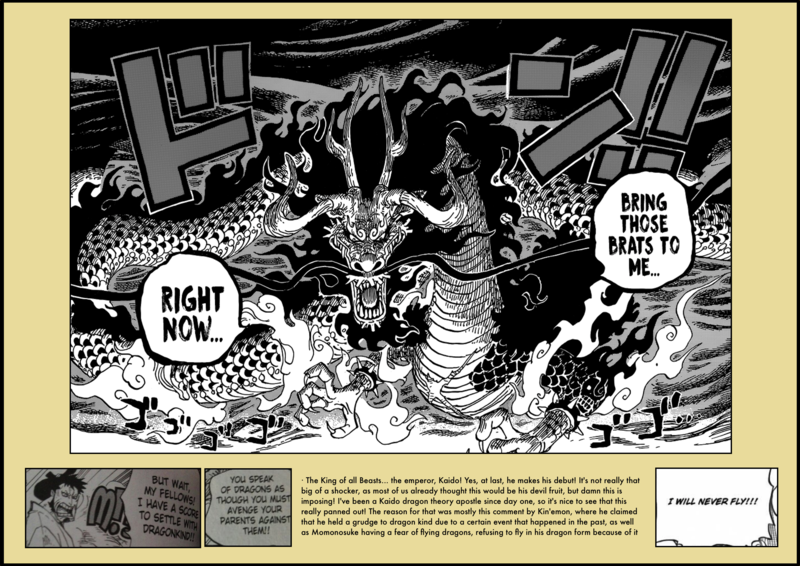 So some are speculating that the dragon that Ryuma has cut is Kaido… What do you say about this theory? Very deep analysis as alwys. But i think you missed an important panel to analyze Artur. When jack nd shutenmaru were fughting, Jack mentioned that Shuten was left alive because kaido wanted to recruit him!!! That simply show how strong shuten is… and he also mentioned of “I did not die back then” impkying something happened in the past, maybe he faught with kaido, and kaido was impressed? 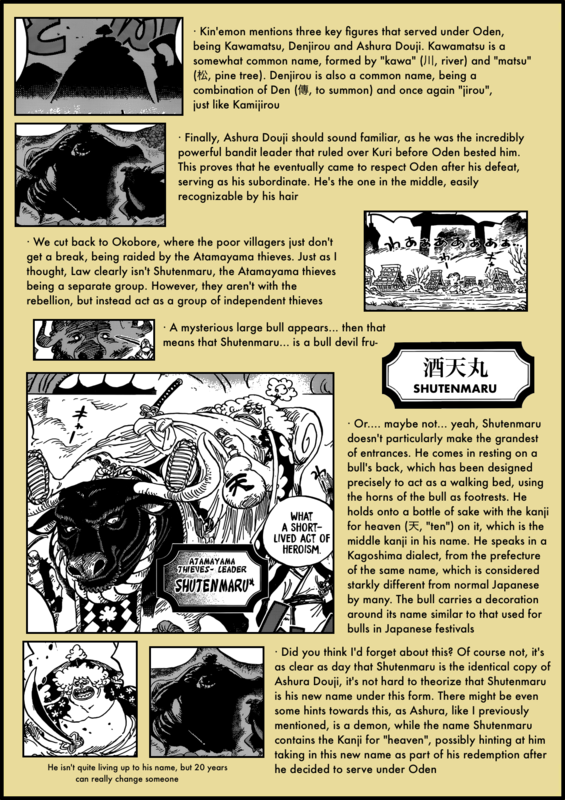 You see how he recognized the dragon immediately… could it be that it was shutenmaru, after all that happened to oden, he faught for revenge and as an end effect, that SCAR in Kaido’s chest was from their fight?!?! Ooooh just some theories from a random guy. 1 – Ryuma killed a dragon. That implies in the existence of dragons in the world of One Piece, even if they are theoretically extinct now. 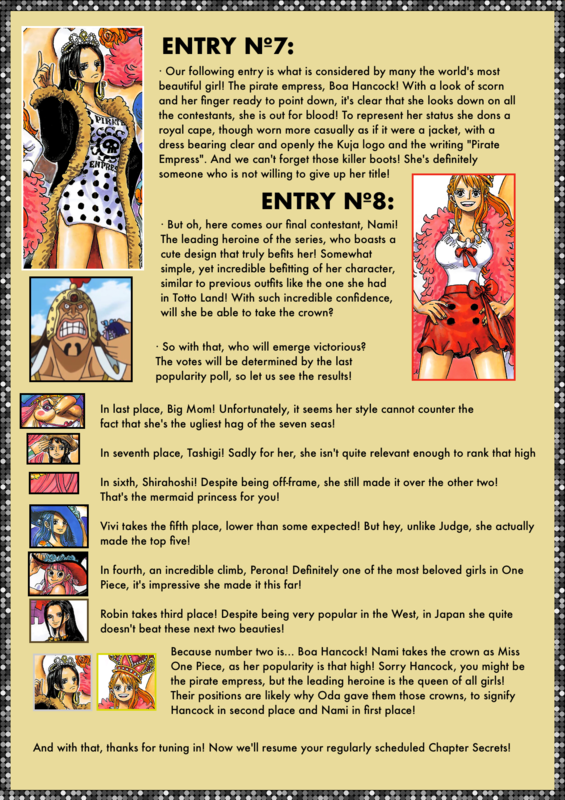 2 – The hate of the samurais and Momonosuke about dragons. 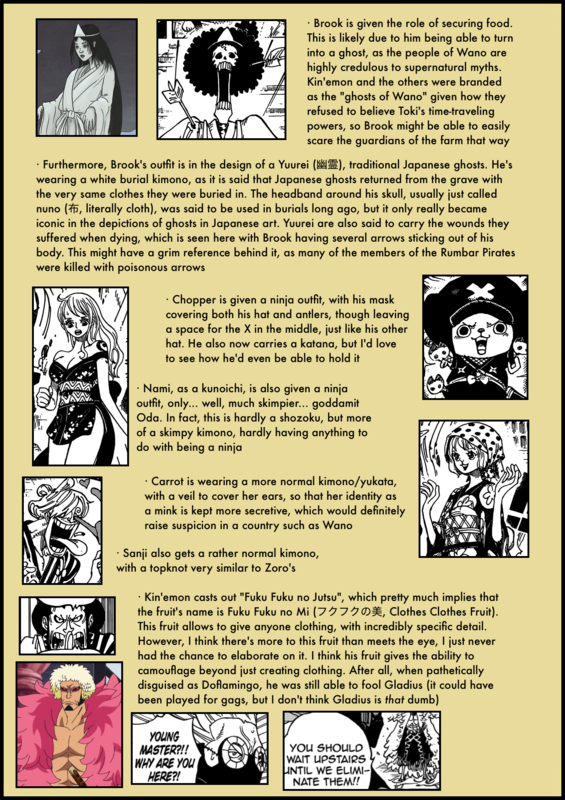 3 – Kaidou is the strongest “creature” of the world, this could mean that he’s not human. The 3 possibilities listed above may have other explanations, but in some research about dragons, i’ve found myths that they could transform into a human form (keeping the horns) and could summon storms and typhoons. Maybe it’s just coincidence, but that’s really similar to the way he appeared in this chapter. 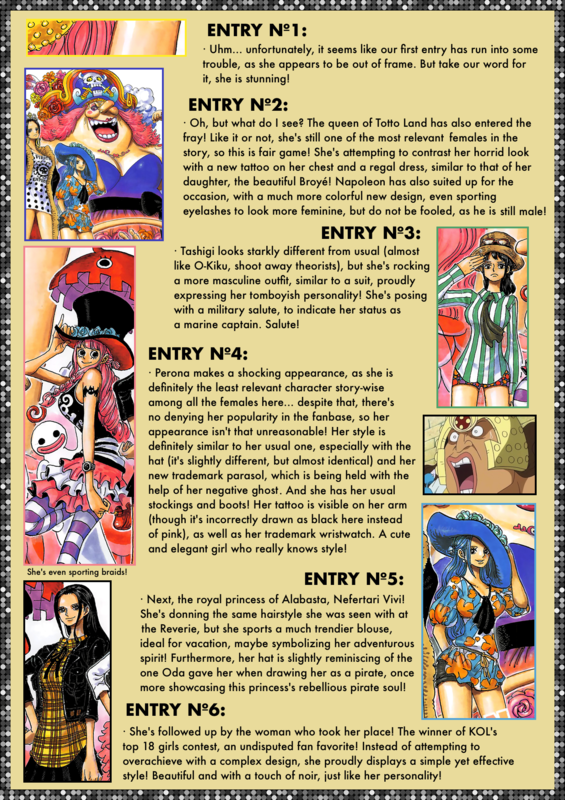 Maybe i’m thinking too much and my ideas may be wrong, but discuss the chapters and try to predict whats next is one of my favorite parts of One Piece. Anyway, i really love your analysis. Thanks for all the hard work. Very nice analysis! Thanks a lot. I am not an expert on the subject but mesoamerican and south american dragons have serpentine designs similar to the oriental dragons rather than the common conception of them. So, I think the word western could be inappropriate. I think this is kind of irrelevant but i just wanted to let you know. Great work as always! 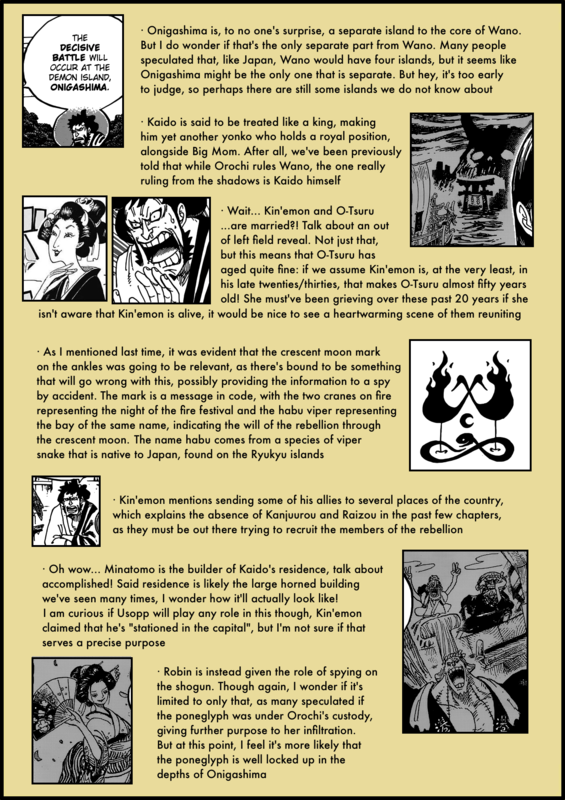 will that be kaido is originally a dragon and ate oni oni nomi? Cause bigmom stated that kaido is a “thing” so he gets his “human form” from the oni oni nomi so that’s explained why the marines couldn’t capture kaido because when they used sea stones to restraint his power, he’s back to his original form which is a DRAGON and he can easily break it. I wonder if his dragon form can spit out fire like Smaug from TLOR? I think he can considering that Oden’s castle was ablaze when kineimon arrived 20 years ago to find Oden’s wife and made the jump. If this is true, than Kineimon is gonna play a key role in defeating Kaido as he is able to cut through fire. 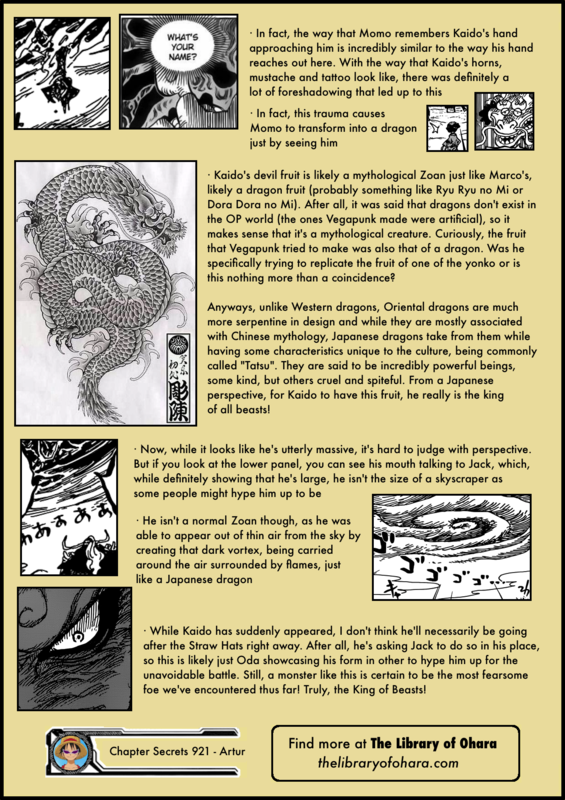 Could it be possible that Kaido is a genuine Dragon who ate a type of Human Zoan? Also, Jack seems to be called an All Star. It could be possible he was demoted. At least those are some assumptions. 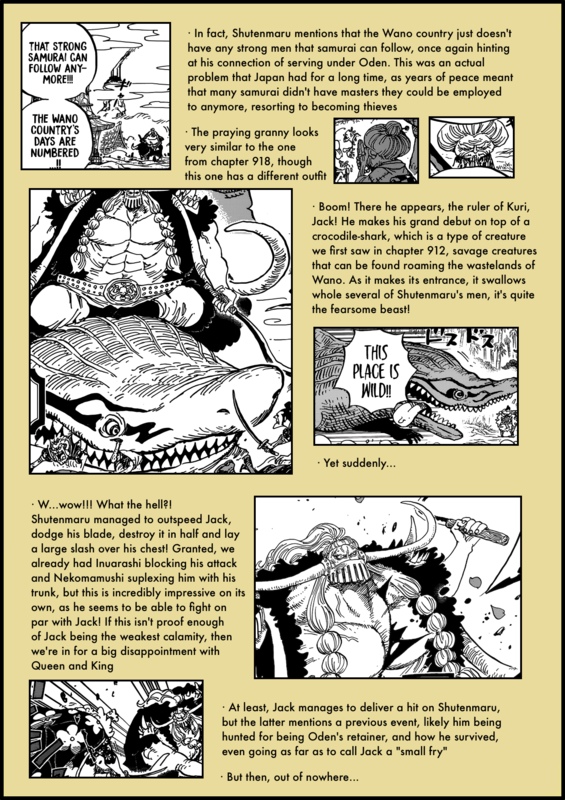 Kaido’s new title isn’t Wise King, so it isn’t a royal one. The raws for the title are 「明王」, which translates as Wisdom King(alternatively known as Bright Kings, Knowledge Kings and Radiant Kings among others), Wisdom Kings are a type of deities in Buddhist mythology (wrathful manifestations of Buddhas). 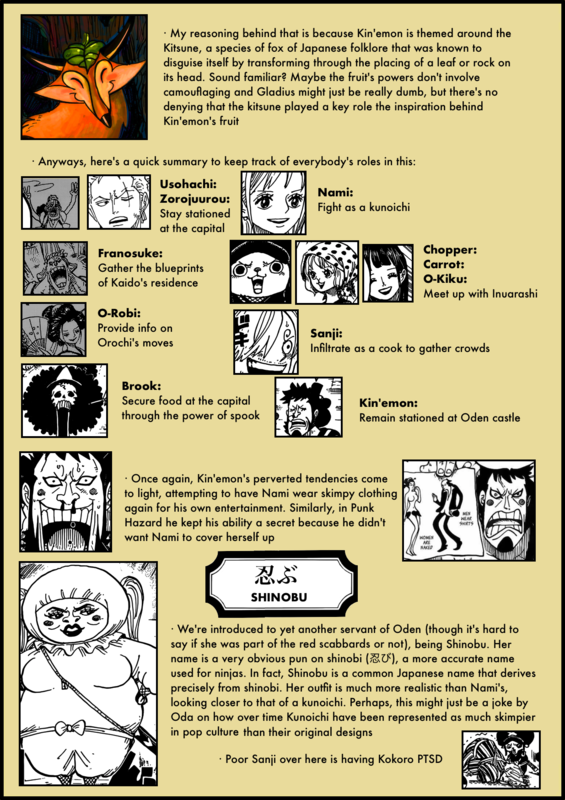 In conclusion, rather than royal, Kaido has a divine position in Wano. Arthur, thank you very much for your comments. I’m impressed how observant you are. Congratulations on the details and for enriching this work that is so beautiful. I’m using google translate to talk to you and translate your Haki from Observation. I’m from Pedro Leopoldo Minas Gerais interior of Brazil.